The City Institute at York University is the home of several funded research projects. These projects have been developed by members of the Institute and are housed in the CITY offices. Inquiries about these projects and their results can be directed either at the researchers directly or at city@yorku.ca. As the region serviced by Metrolinx is at the cusp of major investments into its transit supply and operation systems, we intend to ask what consequences the proposed funding has for the people, communities, and sub/urban municipalities it is meant to provide with better mobility. While the Toronto region is growing by leaps and bounds, we have become aware that such growth occurs increasingly in ways that create more socio-economic and socio-spatial inequalities. Often, the areas with the fastest rising, and most concentrated poverty are also the least well served by mobility infrastructures. We ask specifically whether and how planned transit investments under the Big Move can serve to stave off additional inequalities, whether they might, in fact, improve the situation of people in – often suburban – “transit deserts,” or whether they might, at a minimum, not make things worse for the most vulnerable and immobile groups on our growing city. Mobilizing New Urban Structures to Increase the Performance and Effect of R&D in Universities and Beyond This project examines the specific conditions under which public investments in R&D can do more to stimulate innovation and economic growth. This synthesis speaks directly to emerging best practices in creating and sustaining effective networks, collaboration and linkages of researchers with firms and communities; the transfer of knowledge from higher education to private and public producers and service firms in urban regions; and in stimulating knowledge receptor capacity in the economy. A comparative investigation of the globally-induced transformation of metropolitan governance systems in Toronto, Montreal, Paris and Frankfurt. The focus of this research project, is the urban region with its growing web of metropolitan governance. The emergence of collective action at the metropolitan level in Canada and Europe is examined through infrastructure, public health, green space, and human security. This project explores the legacies of 20th century socialist urbanism in three cities - Berlin, Hanoi and Stockholm – and considers their impact on urban policy, spatial form and everyday life in the 21st century. Through an exploration of changes underway in districts in each of the case study cities, we address three key questions: How is their socialist and modernist past discursively framed – as a problem or a possibility? In what way can urban politics be considered a confrontation with those legacies? 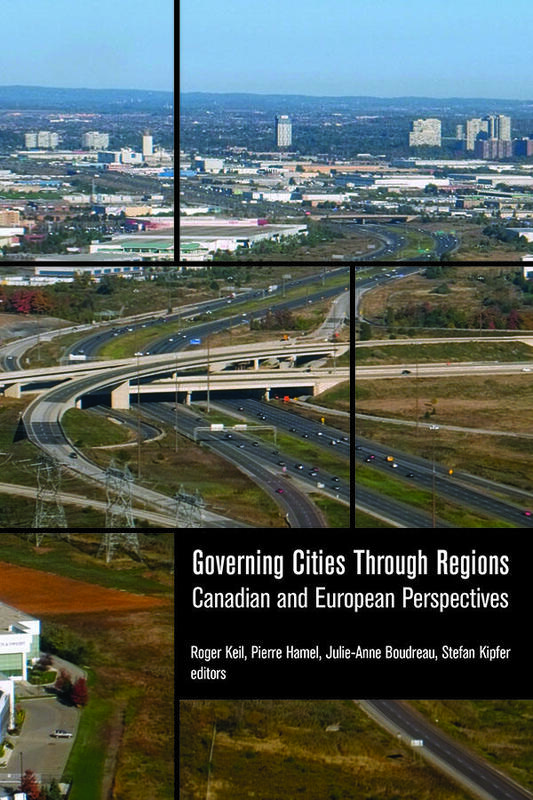 What policy lessons could be applied to Canadian urban regions? A collaborative, international research project focusing on the various 'entrepreneurial' roles that trade unions have defined in the neoliberal period (1980s - current). Organized labour's urban strategies may be qualified as entrepreneurial in the sense that unions are assuming an active role in the promotion and re-regulation of their respective sectors, a role which often entails the promotion of 'high road' employment practices that overlap with the shared concerns of local governments and locally-dependent firms in workforce development, increased inward investment and competitiveness-oriented social policy, and the interests local communities have in the expansion of employment opportunities and the provision of public services. This research project is structured as a comparative case study with five industry clusters (film industry, tourism, green building, child care, mass transit) being compared across two case cities (Toronto, New York City). With city planning focused primarily on the downtown and suburban regions, what lies "in between" has yet to be explored. Using the region surrounding York University, this research project investigates the relationships between investments in highways, airports, institutions and industrial structures, and the frequently under-serviced residential and natural areas that lie among them. New, complex and contradictory landscapes of diverse social, infrastructural and political-economic characteristics have appeared within pre-existing urbanism. Despite their ubiquitous presence, suburban society, space and politics have been unduly sidelined in various bodies of research. The aim of this project is to provide a more holistic understanding of the city's varied landscapes, everyday realities, and contemporary political infrastructures allowing us to grasp the fluidity and dynamism (and emerging contradictions) shaping present-day urban experiences. This project compares diverse, low-income communities in Toronto, Montreal, and Calgary, studying community-member experiences and their perceptions of the opportunities and barriers within public space and institutions, and articulating what needs to change in order to promote a more sustainable and equitable urban future. Based on interdisciplinary research in cities around the world, this project examines the ways in which the local and the global constitute each other, approaching the global city as a process and product which is established through competing social forces operating at multiple scales. Uniquely, the research developed is being disseminated through a book, short documentary feature, series of photographs, and a music/sound CD. This project brings together researchers from a variety of disciplines - fine arts, architecture, urban planning and policy studies, as well as numerous public and non-profit arts organizations - to share information and examine common problems facing Canada's largest cities. The project investigates how creative practices can improve the quality of urban life and planning in Canada. Urban governance of energy and water systems has long been based on assumptions of the traditional infrastructure model, which no longer apply. Considering the restructuring of urban infrastructures, this research project explores the emerging socio-technical regimes of infrastructure provision and investigates new forms of environmental governance and planning. Empirically, the study focuses on energy and water management in Toronto, Los Angeles and Berlin. The relationship between the city and its outlying region has been studied over several decades now, and has brought problems to the foreground that exist in both places but are experienced in different ways. This research project studies the relationship between affordable housing and health, and in particular the relationship between dis- and re-investment into the built environment and social health provision. This research project explores the political use and construction of spaces of urban nature in the metropolitan regions of Birmingham (UK) and Toronto (Canada). The project is specifically concerned with those greenbelts that have been deployed by urban planners as a basis upon which to enact different metropolitan projects and urban regional visions. By combining an analysis of greenbelt politics in Birmingham and Toronto we hope to gain significant comparative insights into the use of spaces of urban nature within very different socio-political contexts and time frames. The City Institute entered an international research and teaching community with the University of Bologna, the future Museum of the City of Bologna, and the University of Denver as part of their now joint International Center for Civic Engagement. The research will focus on the comparison of a few exemplary cities and their different experiences and transformations (such as Berlin, Bologna, Denver, Las Vegas, Toronto). This is a joint initiative of York University and the City of Toronto to create two benchmark documents for the discussion on this subject and perhaps to prepare some future cooperation on the matter. This joint effort offers a great opportunity to create concrete working relationships between the City of Toronto and two emerging York research institutes, IRIS and CITY, on an important subject matter of urban environmental interest. Immigration and urbanization settlement patterns in Toronto and Miami are moving away from the traditional inner city immigrant neighbourhoods to more peripheral, suburban locations. We will expand this perspective to the particular “in-between spaces”, which have now become ports of entry for many immigrants, particularly for those from non-European origin. Urban Sustainability and Environmental Research in Canada: Prospects for Overcoming Disciplinary Divides? The report resulting from this research will not attempt to unravel the future of funding commitments to the environment and the ongoing research that is needed to better shape it. But it will work to situate the present environmental moment in Canada in relation to past such moments. The Policing View is a three-year project, the core objective of which is to offer independent academic inquiry into an area of police, surveillance, and public accountability that has, heretofore, been monopolized by internal police research. This central objective will be addressed through two sets of inter-related empirical and theoretical questions.